$60 - 5x7"original watercolour painting with 8x10"mat, ready to frame! The pleasure of being an artist is being introduced to all the subtlties in life like... I never noticed the white blobs on tigers ears until I painted one. Wild cats markings are truly marvellous! 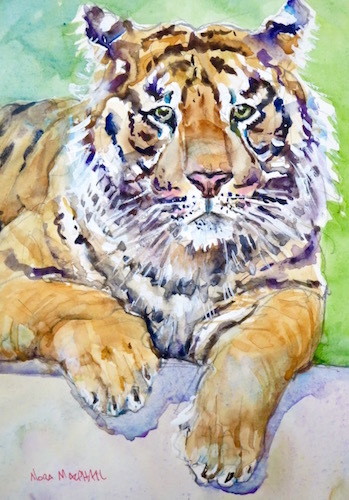 The stripes were a joy to discover and paint. This guy has big meaty paws, one of the few ways to tell a male from a female.